Nourish your dry skin whilst cleansing away impurities with Dermalogica Essential Cleansing Solution. 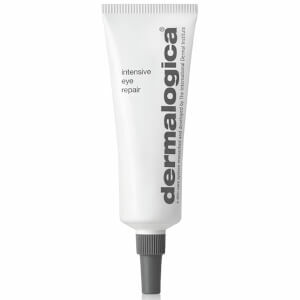 This formula delivers moisture where it is needed most and rinses away impurities without leaving a dulling residue. Rich and creamy, Dermalogica Essential Cleansing Solution contains lemon and pine cone extracts that work to gently lift dirt and remove make-up whilst moisturising safflower oil, hops and rosemary deliver deep-conditioning and soothe irritation. Apply to your face and throat and massage with damp fingertips in smooth upward strokes. Concentrate on any areas with excessive impurities. Rinse with warm water and repeat for professional cleansing results. For best results follow with Dermalogica Multi-Active Toner or Dermalogica Soothing Spray and prescribed Dermalogica Moisturiser. Safflower Oil: Gives nourishing moisture to the skin, relieving dry patches. Lemon Extract: Purifies the skin, unclogging pores. Beeswax: Smoothes and softens, leaving the skin with a velvety texture. Water, Caprylic/capric Triglyceride, Butylene Glycol, Carthamus Tinctorius (safflower) Seed Oil, PEG-8, Polysorbate 60, Cetyl Alcohol, Extracts Of: Citrus Aurantium Amara (bitter Orange) Flower, Humulus Lupulus (hops), Rosmarinus Officinalis (rosemary) Leaf, Equisetum Arvense, Pinus Sylvestris Cone, Citrus Medica Limonum (lemon) Fruit; Sorbitan Stearate, Ricinoleth-40, Beeswax (cera Alba), Ceresin, Benzyl Alcohol, Salicylic Acid, Benzoic Acid, Benzethonium Chloride, Dehydroacetic Acid, Ethylhexyl Hydroxystearate, Tocopheryl Acetate, Aminomethyl Propanol, Ascorbyl Palmitate, Phenoxyethanol, Methylparaben, Propylparaben, Propylene Glycol, Dimethicone, Carbomer, Disodium EDTA, Benzophenone-4.